Former Judge of the Kerala High Court, Justice Siri Jagan has inaugurated the first of its conference series organised by LIVELAW, held at Taj Gateway, Cochin. 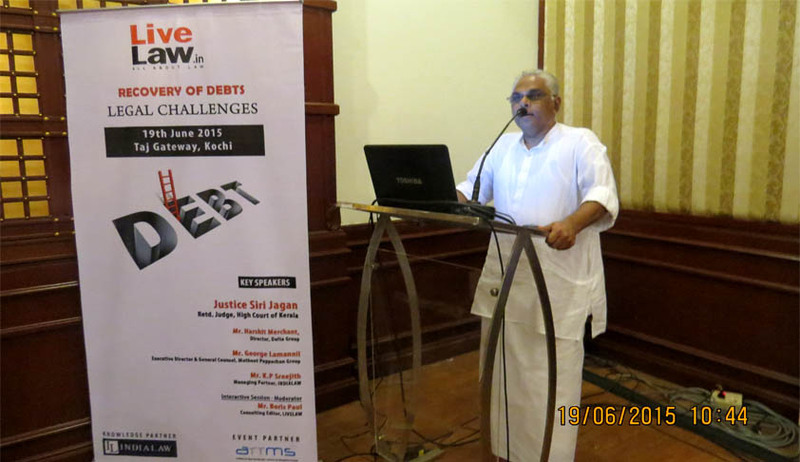 In his inaugural address, the former Judge while speaking on the topic ‘Recovery of Debt & Legal Challenges’ said that SARFAESI Act should be more human in its approach because the Act is mostly misused against small time borrowers by financial institutions. He also drew attention of the participants to the various charges imposed by the financial institutions while giving normal banking services. Mr George Lamannil, Executive Director & General Counsel, Muthoot Pappachan Group, who while speaking at the conference portrayed the other side of the banking transactions and mounting bad debts on a creditor’s point of view. With his rich experience in banking over a period of 35 years, Mr Lamannil narrated various instances in which the financial institutions are defrauded and the prudent measures to be adopted while dispensing loans by the financial institutions. Mr. Harshit Merchant, Director Delta Group, extensively spoke on SARFAESI Act, emphasising on its applicability and legal implications. Mr .K.P Sreejith, the Managing Partner of INDIALAW, a Pan Indian Law Firm which contributed as the knowledge partner to the event, explained the various aspects of recovery of debts, particularly in the context of Arbitration awards and execution, on a practice point of view and shared methods to avoid conventional delays in legal proceedings. The conference was attended by the representative of the major banking and financial institutions of the country. ARRMS, an organisation which facilitates recovery of debts through due process of law supported the event as event partner. Mr.Boris Paul, Consulting Editor, LIVELAW chaired and moderated the event. LIVELAW has scheduled a series of conferences on various branches of law and hot legal issues.